This turns out to be a stunningly superficial defence of the Finch Report by one of its authors (and the one from whom one might have hoped for a much fuller grasp of the Green/Gold contingencies, priorities and pragmatics). The substance of Martin Hall's defence of the Finch recommendation that the UK should (double-)pay for Gold instead of strengthening its mandate for Green is that (1) Gold provides the publisher's version of record, rather than just the author's peer-reviewed final draft, that (2) Gold provides text-mining rights and that (3) Gold is the way to solve the journal price problem. 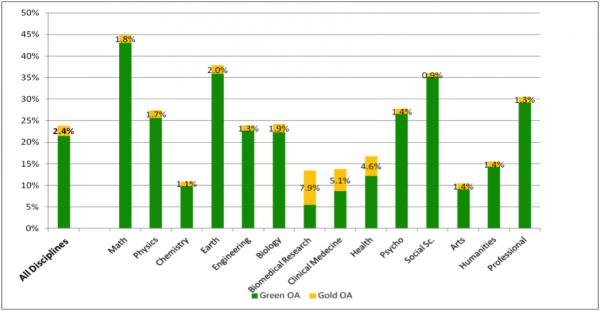 What Hall does not even consider is whether the publisher's version of record and text-mining rights are worth the asking price of Gold, compared to cost-free Green. His account (like everyone else's) is also astonishingly vague and fuzzy about how the transition to Gold is to take place in the UK. And Hall (like Finch) completely fails to take the rest of the world into account. All the reckoning about the future of publishing is based on the UK's policy for its 6% share. The Swan/Houghton economic analyses, too, are cited by Hall, as if in support, but in fact not heeded at all. It will be instructive to see whether the remarkable superficiality of Hall's defence of Finch is noticed by the UK academic community, or it is just catalogued as further "authoritative support" for Finch/RCUK.